The bacteria is called flora ‚ and it protects you from pathogenic organisms, the ones that cause disease. The flora in your mouth is composed of both helpful and harmful bacteria. When you have plaque formation, it’s a sign that the bacteria ratio has shifted in favor of the harmful. The harmful flora irritates the tissues, damaging your gums through the production of acid, which can lead to infections.If plaque stays on your teeth for too long, it will harden into tartar and can cause permanent damage to your teeth and gums. 1. Brush Regularly and Thoroughly: Plaque begins forming on teeth 4 to 12 hours after brushing, which is why dentists recommend brushing at least twice a day. Be sure you brush all the areas of your mouth, including teeth, tongue, gums and even the insides of your cheeks. If plaque buildup is an ongoing issue for you, you may want to try an electric toothbrush. Electric toothbrushes have been proven to successfully remove more plaque than manual toothbrushes. You could also try a tartar control toothpaste, which contain an active ingredient that interferes with the formation of plaque from bacteria. 2. 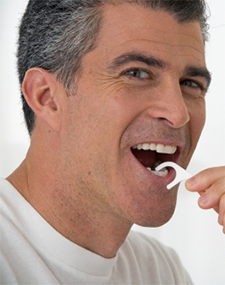 Floss Daily: Remembering to floss every day can be a challenge. However, it is critical to get at the plaque that accumulates in hard to reach areas between the teeth. When you brush, you are only really cleaning about 60% of your teeth. The best way to ensure you are removing all plaque is to brush and floss. If you struggle to use traditional floss, try out an alternative such as a soft pic or proxy brush. 3. Use a Mouth Rinse: Not to be confused with mouthwash, mouth rinse is normally used prior to brushing and flossing to help prevent plaque buildup and bad breath, whereas mouth wash is generally used after brushing and flossing to freshen breath and kill any remaining germs. Incorporating a mouth rinse into your daily oral care routine is a great way to help fight plaque. 4. Watch What You Eat: When your mom told you not to eat a lot of sweets, she was watching out for your teeth. Foods high in sugar and starch encourage the production of acids, which can destroy tooth enamel and, over time, result in tooth decay. There is no need to eliminate these foods from your diet; however, it’s important to brush your teeth shortly after eating them. Not all foods contribute to plaque buildup. Fibrous foods like fruits and vegetables stimulate saliva flow, which helps wash away food particles and neutralizes acids, keeping them from attacking your teeth. Additionally, calcium-rich foods like cheese, milk and yogurt mix with plaque and cling to teeth, helping to protect them from the harmful acids. 5. Visit Your Dentist: Schedule more frequent dental cleanings. Getting professional help to remove the plaque buildup on your teeth is always a wise move. No matter how much you brush and floss, there will be areas in your mouth that you cannot properly clean yourself. Incorporating these five easy habits into your oral health routine will help fight the battle against plaque, in turn, helping to prevent tooth decay and gum infections.